We gave you the heads up about this one months ago, but the show is approaching fast. If you haven't already, get your tickets for this one night only, all ages, multicultural, feast for your ears. 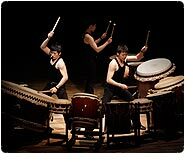 The visceral intensity, the athleticism, of taiko drumming in the hands of a master group like Japan’s Kodo may feel like the polar opposite of kabuki theater’s controlled, nuanced performances. Yet when Kodo announced it had found a new Artistic Director in kabuki icon Tamasaburo Bando—often referred to simply as “Tamasaburo”—it made perfect sense. They both draw on the deep well of traditional Japanese culture, rooted in a long lineage and sense of place that bring unflagging precision and profound personal commitment to their work. It runs through the explosive power of a giant booming drum stroke and through the most delicate of hand motions, though the harvest celebrations and demon dances to the most refined and urbane stages. Now their joint labors are coming to America in early 2013, with a tour that will feature several re-envisioned and new pieces guided by Tamasaburo’s distinct aesthetic and deep experience. Tamasaburo, known for his stunning, subtle onnagata (female roles), grew up in a kabuki family, steeped in the art form’s complex movements, visual language, and painstaking stagecraft. A performer since his early teens, the actor rose to prominence, winning a worshipful following worthy of a Hollywood star. He wowed arthouse fans by performing in films by revered European directors such as Andrzej Wajda. He was recently declared a Living National Treasure, one of the highest honors bestowed on prominent Japanese citizens. Tamasaburo and Kodo have felt this breath on Sado. The island saw an influx of new inhabitants when gold was discovered during the Edo period, as well as several centuries of artists and intellectuals in exile, extraordinary men banished by Japan’s rulers for political reasons. “Many cultures in turn came to Sado on thousands of ships from all over Japan. That made the island’s culture very complex and interesting,” notes Kodo member Jun Akimoto, who has worked with the group for over a decade. Though intimately tied to the cultural developments on the rest of Japan, remote Sado has retained an astounding level of traditional culture, roots that express themselves in everyday moments. Across the island, for example, foodways long forgotten elsewhere on Japan still thrive, from tiny home noodle parlors to the freshest of sushi. Prized sake is brewed from hand-planted and –harvested rice—agricultural practices learned by every Kodo apprentice to deepen their understanding of traditional culture. On this unique foundation, Sado Island became a haven for artists seeking a different, more communal approach to creativity and tradition in the mid-20th century. Growing from a dedicated community of seekers, Kodo has developed its own way of life, trained hundreds of apprentices, built a remarkable arts village. In Kodo Village, not only do musicians gain intense discipline, commitment, and an enviable skill set; they also work in the fields, perfect their practice of the traditional tea ceremony, or help build sustainable and sleek furniture in the village’s workshop. This organic totality of artistic vision attracted Tamasaburo, who happily set aside urban life for the quiet, almost magical remoteness of Kodo Village. The seasoned artist has grasped his new role as an opportunity to challenge himself, Kodo’s performers, and his audiences more deeply. Tamasaburo envisions Sado’s isolation as a way to connect with some of the performing arts’ most vital currents.